VW and Audi strongly recommend the use of synthetic based oil complying with Volkswagen / Audi motor oil quality standard VW 502 00, 504 00, 505 00 or 507 00. At German Car Depot an oil and filter service includes the factory recommended oil and a full mechanical inspection of your vehicle. Our technicians will check 27 items including the condition of your timing belt, cooling system, charging system, brakes, all fluids etc. This inspection helps identify potential problems before they actually become problems. The oil change interval recommended most often by Volkswagen and Audi is every 10,000 miles when your vehicle is driven under ideal conditions. Most experts and enthusiasts agree that changing your oil at no more than 5,000 miles is a much better idea, especially if your engine is turbocharged, has higher mileage or is a TDI turbo diesel. Other circumstances where oil should be changed more frequently include. Operating your vehicle in dusty areas. Driving in predominantly stop-and-go traffic. Operating at high speeds or high performance driving. Driving in temperatures below freezing for extended periods. Let your service advisor know if any of these conditions describe your driving style. The first picture is of a pickup screen that is clogged with sludge, reducing engine lubrication and causing major engine damage. 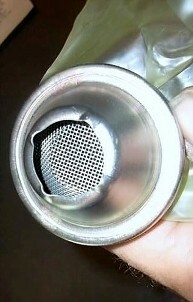 This problem occurs when the wrong oil is used or when the oil and filter are not changed at recommended intervals. 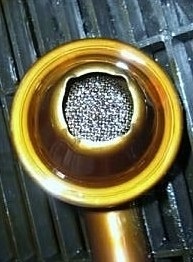 An oil pickup screen from a Volkswagen 2.8 V6 engine where oil sludge developed.